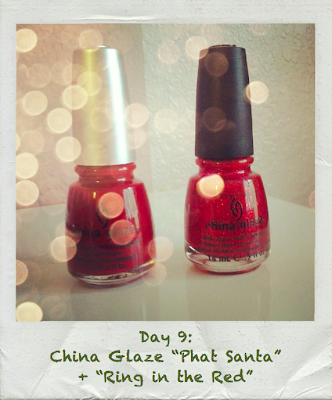 What I Blog About When I Blog About Books: 9th Day of Christmas: China Glaze "Phat Santa" + China Glaze "Ring in the Red"
9th Day of Christmas: China Glaze "Phat Santa" + China Glaze "Ring in the Red"
I mentioned in my Holiday notd yesterday that I would would be doing a notd today for what I considered to be the classic holiday manicure. 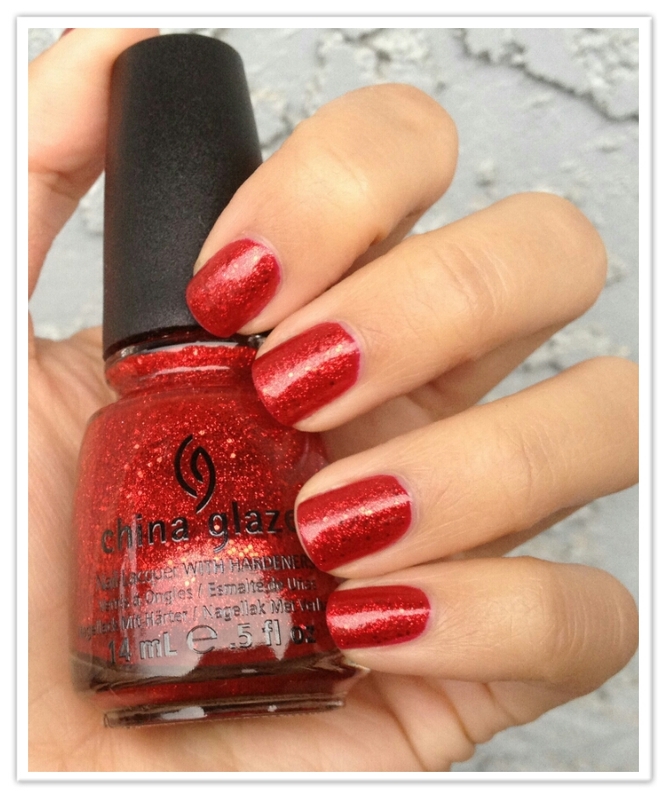 And what I have for you is a gorgeous glittery red manicure using China Glaze 's "Phat Santa" and "Ring in the Red." These two combine to make an eye-catching manicure that is relatively easy to wear, and is a must in the holiday season. If you want to see photos of "Phat Santa" as well as a complete review, you can find mine here. "Phat Santa" is essentially a basic jelly red. I chose to use as a base under "Ring in the Red" for it's vibrant color. "Ring in the Red" has become my favorite red glitter. It has glitters in various grades that makes it capture the light amazing. 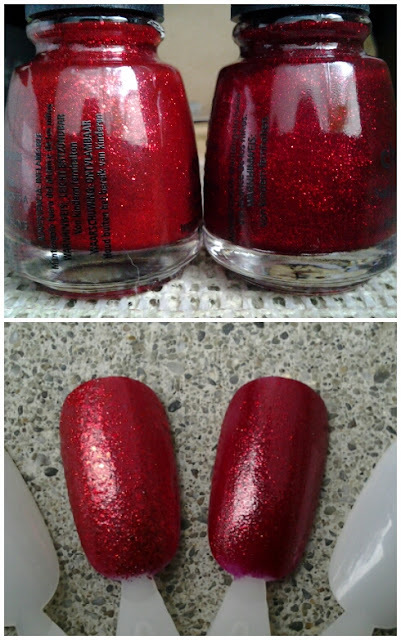 "Ring in the Red" has very fine glitters as well as slightly larger glitters, however, it is free from the larger, chunkier glitters. The combination of different sized-glitters is part of what makes me love this polish. 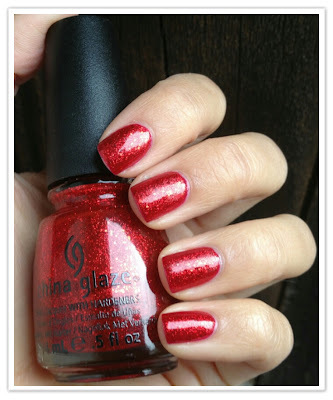 The fine glitters coats the entire nail rather than being like Sephora by OPI's "Beclaus I Said So" that is more of a red glitter top coat in a clear base. Also, one more thing to note, "Ring in the Red" dries semi-matte. So if you're like me and love a glossy finish, you will need a thick layer of top coat! Until it's release last year, my go-to glitter red for the holidays was China Glaze "Ruby Pumps." I went back and forth a lot on whether or not I even needed "Ring in the Red" if I had "Ruby Pumps" but I'm extremely glad I did. The two colors are very different. I took some comparison swatches below that, though they are not entirely clear, gives you the gist of their similarities and differences. 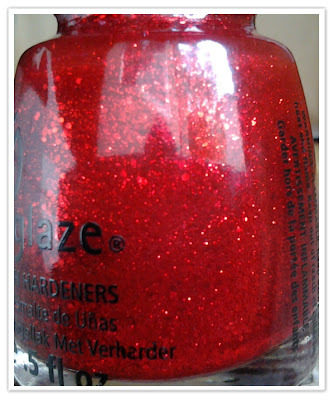 "Ruby Pumps" only has fine glitter, whereas "Ring in the Red" has various grades, including fine. The other obvious difference is that "Ring in the Red" is much brighter as well. That is probably what made me most anxious to get it. I felt like the vibrant red was even more perfect for holidays. I do still wear "Ruby Pumps" during the holidays, just not as often now that I have "Ring in the Red." If you would like to see more photos and a complete review of "Ruby Pumps" you can find mine here. I love, love, love this red glitter. 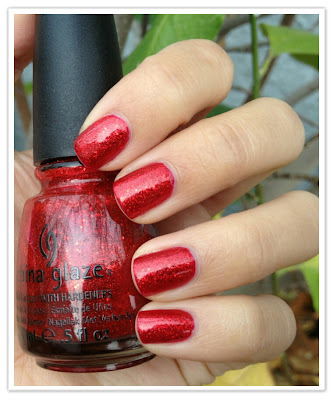 It has an amazing shine to it and is the epitome of the class holiday red. This last photo is definitely the least accurate in color (the photo suggests the color as a red-orange, but it is definitely not), but I felt it did the best at capturing the various gradations in glitter sizes. I hope you enjoyed this manicure. It is always one of my favorites to wear in the holidays! NOTD: OPI "The One That Got Away" + Zoya "Kissy"
22nd Day of Christmas: OPI "Gone Gonzo"
21st Day of Christmas: OPI "Excuse Moi"
12th Day of Christmas: China Glaze "Mrs. Claus"